I am excited to announce that a free night of entertainment will be provided for all members on Thursday 17th April from 6.00pm to 9.00pm. JB Entertainments is working with us on certain events this year and is keen to showcase some of their acts. They will therefore be bringing some tribute acts along to entertain us (Olly Murs and Michael Buble to name a few! ), along with some finalists from this year’s Essex Factor (previous finalists have appeared in the final line up of X Factor). Posters will be up around the Clubhouse giving further details. Don’t forget that food is available on Thursdays from 5.00 pm, so why not make a night of it! All members are welcome, so come along and enjoy some ‘famous’ faces at no cost whatsoever!! 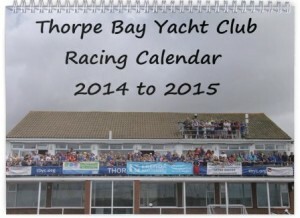 Don’t miss the start of the Racing Calendar which covers 12 months from Apr14-Mar15. 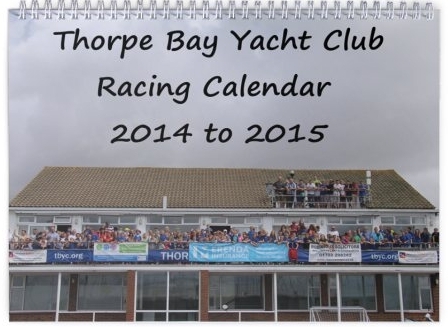 The Calendar is available for purchase at the club bar with an excellent price reduction for this year. The 2014 price is £8 (previously £12). We have ordered a similar amount to last year, however if we run out please pay and we will submit a further order at the end of the month. All the racing dates in a popular format, with familiar scenes and saving you loads of time writing the programme up somewhere else. 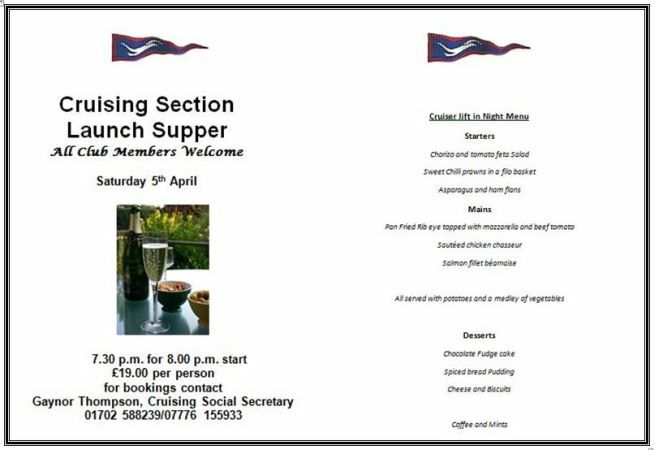 You will have seen that in order to accommodate more sailors coming off the water who require a ‘post sailing’ snack, from this weekend Scott has very kindly added some items to his menu – pre-made baguettes or mug of soup and a roll. He will also be offering a quick, one-pot option for those who require something more substantial – this weekend it’s chilli and rice! He will be taking orders prior to sailing (look out for an order form next to the sign-on/off sheets in the bosun’s hut in the next couple of weeks to save you some time) for those who require a quick turnaround, and your food will be ready when you return. Please support Scott in his efforts to accommodate us! As from this weekend there will be post sailing dishes such as mug of soup, pre ordered baguettes, and chilli and rice they will be advertised all will be cheap and cheerful. Another video of the full lift in. Many thanks to Ian Homan for the fantastic aerial shots and Barry Duce for the flying sandhopper. Congratulations to Sam and Jacob for winning the Winter and Icicle Series in their RS Feva. On Saturday we will hold a ‘Warm-up’ RS Feva Mini Race series starting at 10.00 am with a Cake as the prize; to be shared of course! (Elmore Rib and donated Cake). The Programme has been sent by E-Mail to existing RS Feva Cadets and parents, and is on the TBYC Facebook page. We welcome new sailors to our active RS Feva Fleet (ideal for 11 – 16 year olds). Do not hesitate to phone me on 07815 113459 with any questions. As usual all Cadets are welcome to attend our RS Feva sessions. Sunday Carvery 30th march MOTHERS DAY !!!!!!!! NOW FULLY BOOKED !!!!!!! Don’t miss the Carvery this Sunday. With it being mothers day its a brilliant time to enjoy a great day at the yacht club there is no holds barred on this lovely day and a good time to bring the family down. The usual wonderful food will be available the usual carvery with some extra bits but also my new wonderful menu . Please phone and book so I can sort a table out for you.